The Cuisinart Programmable Coffeemaker Brew Central 12-cup coffeemaker, has a classic design with stainless-steel accents, brews up to 12 cups of coffee at a time and offers 24-hour programmability with a variable heater plate for temperature control. The unit provides a 1-to-4 cup setting for brewing a smaller amount without compromising flavor, and its brew-pause function allows for pouring a cup before the brew cycle has completed. The DCC-1200 includes a 12-cup carafe that comes with a generous stay-cool handle, knuckle guard, and dripless pour spout. Other highlights include simple push-button controls, LCD display, convenient water window, easy-fill reservoir, and 60-second reset memory function that "remembers" the settings and stage in the brewing process in case of power interruption. 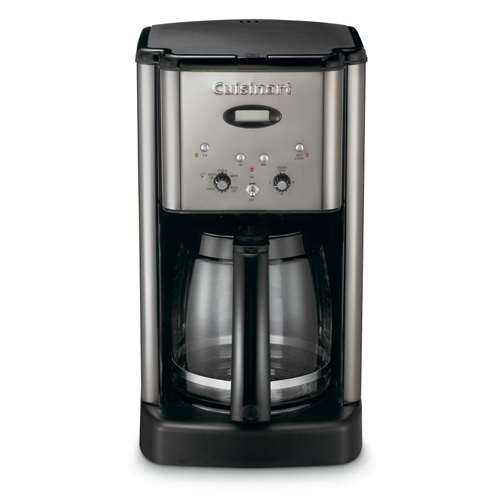 The Cuisinart Brew Central Cofeemaker 12 Cp Blk Nic has many exciting features for users of all types. You can extend the lifetime of your Cuisinart Brew Central Cofeemaker 12 Cp Blk Nic with the purchase of a FactoryOutletStore Factory Protection Plan. See the Cuisinart Brew Central Cofeemaker 12 Cp Blk Nic gallery images above for more product views. The Cuisinart Brew Central Cofeemaker 12 Cp Blk Nic is sold as a Brand New Unopened Item. This is the second one of these fabulous coffeemakers that I have had. The first one lasted only 23 YEARS!!! I'm serious....23 years!! I used it every day for at least three cups of coffee but many, many times for the full 12 cup capacity. My "old timer" finally died last week so I ordered a new one. It no longer comes in all black, which I prefer, but the new stainless and black version looks fine. The shipping on this was fantastic. I live in remote northern Maine and it arrived in just TWO days. I cannot say enough good about this transaction!! BUY ONE!